"When I was a junior, I was stretching outside and noticed Franklin Field has this kind of Colosseum look about it. I called it the arena because the image I had was of the Christians and the lions. You hear this roar that something happened, and all I'm thinking about it some poor Christian in there getting eaten by a lion. Obviously it's somebody getting run down. I had this kind of image where you needed to be a gladiator to go in there to fight your way literally, not necessarily metaphorically." - Villanova head coach Marcus O'Sullivan talking in an interview about the amazing experience that is competing at the packed stadium during Penn Relays. 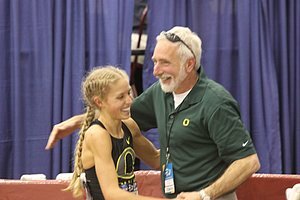 Recap Of Oregon's Performances At Oregon Relays: OTC's Tyler Mulder Won 800 In 1:46.79, NFL Football Player Jordan Kent Won 400m Also Geena Gall of OTC and Oregon's Anne Kesselring finished 1-2 in the women's 800 with 2:02.04 and 2:02.44. 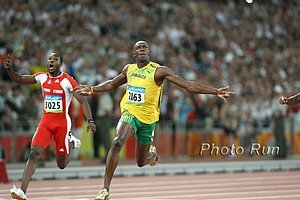 *The Dual Meet: How To Reinvigorate Track And Field's Relevance Writer says, "A return to the youthful days of middle school and high school dual meets where the goal was winning for the sake of it instead of for a cash prize or a huge title would strengthen the interest of the sport and bring the athletes a change in the schedule that has been crowded with invitationals that lose the competitive fire of the dual meet style." London Champ Emmanuel Mutai Envisions 2-Hour Marathon We are a long way (or a super-rigged course) from a 2-hour marathon, as no one has ever split sub-1 hr in a marathon. 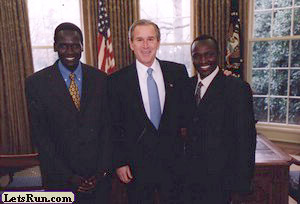 LRC Rojo Speaks: Boston - Please Stop This World Record Nonsense "(Boston), you are the most historic of all the major marathons and don't need publicity stunts ... You don't need a record to validate what happened. In fact, you shouldn't want it. Your race course has character and tradition behind it - all most of the others can do is get in a contest amongst themselves for time." Jubilant Crowd Meets Geoffrey Mutai On His Return To Kenya - He Says He Wants Olympic Title As for the wind, Mutai wonders why if it was so big, then why didn't the women run faster? He also says he won't run the WChamps. G. Mutai Says Weather In Boston Was "Bad," Course Was Tougher Than Any Other Course, But He's Not Upset He Doesn't Have WR - Now He'll Will Just Be More Motivated Mutai: "Kenyans do not trust themselves and depend on others tactically during races. They can do better if they have self belief." Emmanuel Mutai Returned To Kenya The Day Before - Says He Envisions 2:00 Meanwhile, London 3rd placer and NYC champ Edna Kiplagat says she wants to run Worlds. She could do Worlds and NY and get more WMM points. Coach Knows Best: Olympian Blake Russell Says She Just Wasn't Suited Well For Boston's Downhills She dropped out before halfway on a course her coach told her not to run. 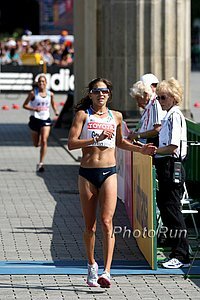 Blister & Upset Stomach Are Explanation For US Olympian Lewy Boulet's Poor London Showing She stopped at mile 23 but got going again and explained, "A disappointing race is better than a DNF - emotionally, it takes less time to get over." Kip Keino Speaks About Boston - "It's up to the IAAF to decide." Independent: Is Keitany Radcliffe's Ultimate Rival? 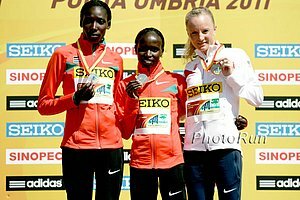 Moses Arusei Runs Sets New Course Record In Madrid (2:10:51) Girma Tadesse defended her women's title. Marathon Legend Ingrid Kristiansen Praises Paula Radcliffe's Strategy In Coming Back Slow From Childbirth & Preparing For London 2012 She thinks the focus for Paula should not be on chasing another WR, but on getting read to win gold in London. BBC Piece On Russian HJer Ivan Ukhov He's come a long way since showing up to a meet drunk and collapsing on the mat 3 years ago. 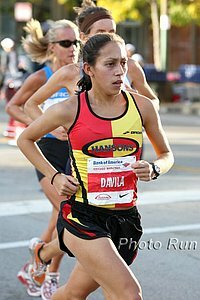 Judge Throws Out Drug Trafficking Charge Against World Steeple Champ Marta Dominguez Thankfully, she still faces counts of tax evasion and allegedly administering medications without a license. 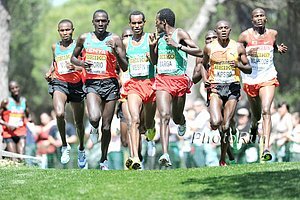 *Former European XC Champ Alemayehu Bezabeh Also Is Cleared Of Doping He's the one who admitted his blood was in a bag. Oregon 400m Freshman Mike Berry Appears To Be The Real Deal A World Jr. gold, a 3-month marijuana suspension, and now a 45.5 split. 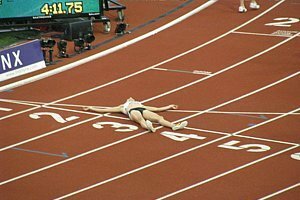 Jessica Ennis Worried She May Miss Outdoor Season The "minor" injury has apparently kept her from running or jumping for 7 weeks. Scandal? London Hotels Withdraw Promise To Give LOCOG Hotel Rooms Cheaply They were going to do it but then found out that they were being flipped by ticket resellers for a HUGE profit. 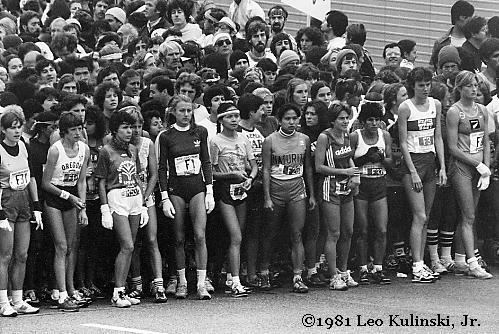 Former Boston Marathon Champ And RW Editor Amby Burfoot Says Boston Should Withdraw Its World Record Application "On the day he (Mutai) ran Boston, it was an artificially fast course, due primarily to the steady tailwind." Famed Coach Renato Canova, Coach Of 2:03:06 2nd-Placer Moses Mosop, Says Wind Only Had "Small Advantage" We disagree with his wind analysis but agree "The reality is that Marathon is changing" with sub-27:00 10,000m guys running it in their prime. 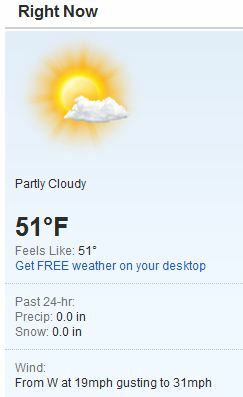 A World Record For Boston? We Didn't Feature This Enough: Sciene Of Sport Blog Estimates Boston Wind Was Worth 3-4 Minutes That's exactly what LRC's JK predicted BEFORE the race. Chicago Tribune's Philip Hersh Agrees With Wejo, Desiree Davila: Pure Guts Hersh, of course, writes more eloquently than Wejo did yesterday, and says let's discuss the wind another day but praise Desiree. 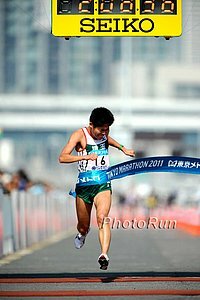 The Boston Marathon, A Divine Tailwind, And "The Mother Of All Asterisks" Author says this year's Boston is "exactly the type of race that the asterisk was designed for" and that "in track and road running, times are just too important to view them without context, especially the outliers." DailyNation Explains Why Mutai's Time Isn't A WR; BAA's Tom Grilk Says, "No one could have predicted that a time like that would be run." Obviously, he didn't read JK's quote of the day from Sunday. The Independent: A 2-Hour Marathon Is The New 4-Minute Mile And Paula Radcliffe's 2:15:25 is worth a 2:01:58 by a man. Guy Who Ran The Boston Marathon For 44 Years In A Row Noticed The Distinctive Tailwind "The tailwind really was a wonderful asset. 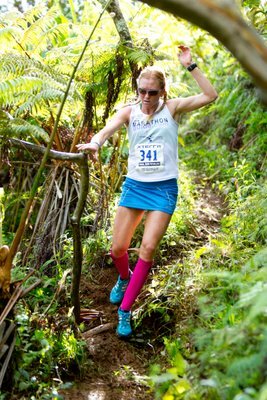 It blew us along for the final miles when you're really fighting yourself, wondering if you can keep going." The Oregonian: Ken Goe Gives A "Mainstream" View Of The Boston Results And Voices His Problems With "Stat Geeks"
A World Record For Paula? Possible New Rule For Women's Marathon Would Create Two World Records: One For Mixed Races And One For All-Women This would mean Paula Radcliffe's 2:15:25 she ran in a mixed race would be a separate record from the 2:17:42 she ran in an all-women race. The 2:15 is "invincible," but the 2:17 could be at risk from runners like Mary Keitany. Check Your Scores Here And See If You Won The $450 Our very own Rojo opened his mouth and said if 1 of 4 guys didn't win London we'd throw in additional $300. Rojo is famous for his bold predictions. If you liked our contest, remember the easiest way to show your appreciation is by buying shoes from our partners. Click here to save 15% off at Road Runner Sports.